At age 16, Benjamin Krasner is graduating from CSUN in May 2016 with bachelor’s degrees in music and economics. Photo by Lee Choo. If Benjamin Krasner’s educational career up to this point were defined by a musical term, it would be allegro — a brisk, lively tempo. This week, Krasner will graduate from California State University, Northridge with two bachelor’s degrees — one in music and one in economics — and this fall, he will head to Yale University on a full scholarship to pursue a master’s degree in music. He’s hit all these high notes at the tender age of 16. That’s not a typo. At age 12, Krasner enrolled in Pierce College, and by 14, he had transferred to CSUN. Before his acceptance at Pierce, Krasner had to complete a number of interviews and take a host of placement tests “to prove that I was ready to hold my own in this [college] environment,” he said. His adjustment to college classes and life took some time, Krasner said, but he surrounded himself with other musicians and soon thrived. Four years later, the teen has grown quite a bit — in height, in musicianship, in maturity. With a head of dark, curly hair and bright, dark eyes, Krasner is friendly, easygoing and carries himself with the air of a confident college student. “Every time I tell my story to people, I see a shift in the way they treat me,” he said. “When they know my age first, they treat me more carefully — it’s strange. But when they learn I’m a college student first [before learning my age], they see me with more respect. Krasner credited his mother — an artist and Russian-Jewish immigrant with a master’s degree in mathematics — with his early success. His mother and father, who works in IT at Amgen, emigrated from Russia to Northridge in the early 1990s. The couple moved to Malibu after the 1994 Northridge earthquake. His mother tutored Krasner and his two siblings in advanced math from a young age, and his father has been supportive and helpful through all his studies, Krasner said. His older sister, Danielle, was the first to forge an early path to college. Danielle enrolled at California State University, Los Angeles at age 12, and by 16, she’d earned a bachelor’s degree in biochemistry. She also went to Yale, where she completed a master’s and doctorate in biochemistry. She’s now 24, working on a postdoc at USC — and advising Benjamin on what to expect in New Haven, Conn.
After completing his master’s, he hopes to pursue an artist’s diploma (a two-year program) and a doctorate. He wants to tour as a pianist, he said, and someday, to teach. Krasner said he owed his development as a musician to his mentor and piano teacher for almost 10 years before arriving at CSUN, Lubov Sorochkina, a former professor at USC and the Moscow Conservatory. Although piano is his focus and his passion, he chose economics as a double major for its practicality, Krasner said. He credited his CSUN professors — especially his economics advisor, department chair Nancy Virts, and his piano teacher, keyboard studies chair Dmitry Rachmanov — with inspiring him and guiding him through the challenging balancing act of a double major. Krasner was learning and playing well beyond his years — memorizing musical scores, progressing and winning many local contests and festivals, Rachmanov said. Krasner lauded CSUN’s music program as one that encourages students to be active on campus, with chamber groups and competitions. Krasner’s parents encourage a well-rounded life as well, he said. Beyond academics, the teen nurtures passions for surfing, travel and hanging out with childhood friends. “Growing up, I did any sport that didn’t endanger my hands, like swimming, skiing, surfing,” said Krasner, who began playing piano at age 5. First, however, he’ll walk across the stage in cap and gown in front of CSUN’s Delmar T. Oviatt Library, in not one but two commencement ceremonies — claiming diplomas from the Mike Curb College of Arts, Media, and Communication and the David Nazarian College of Business and Economics. This graduate shows no signs of slowing his tempo. 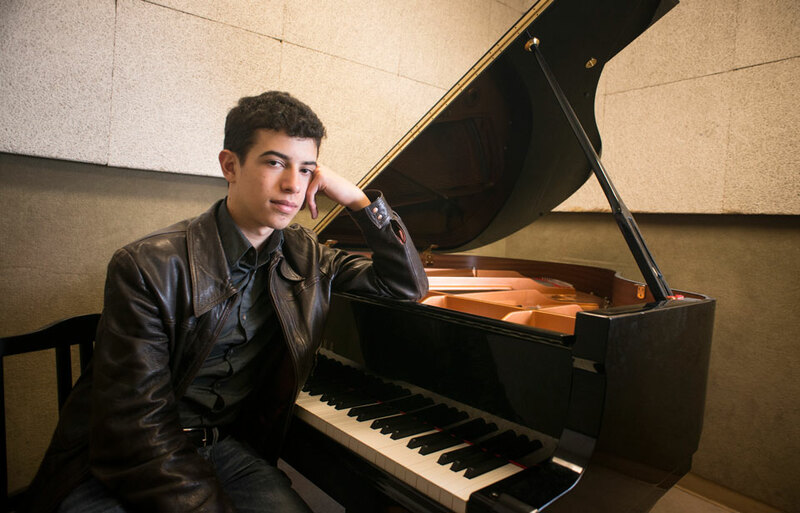 After double majoring in piano performance and economics at CSUN, Benjamin Krasner, 16, will head to Yale University on a full scholarship this fall to pursue a master’s degree in music. Photo by Lee Choo.